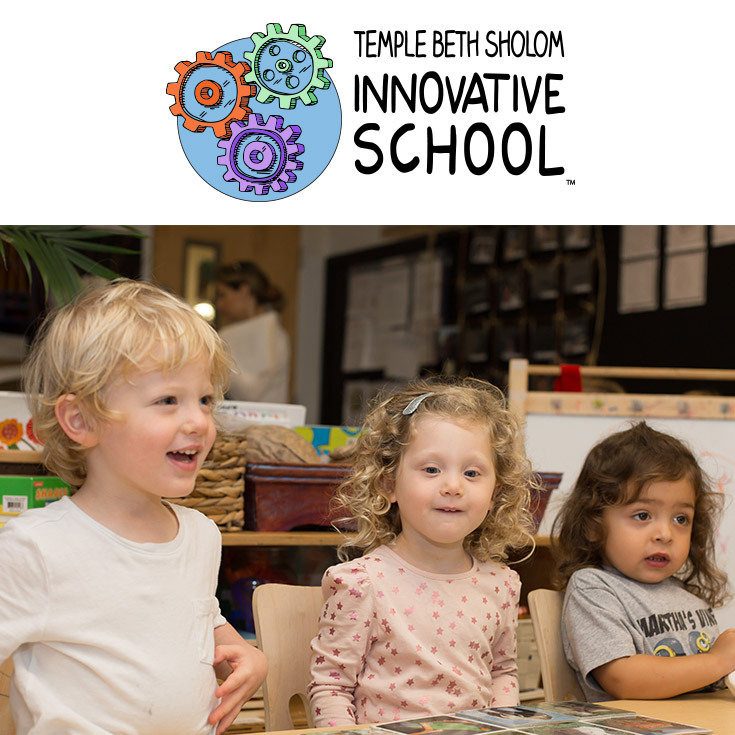 At Temple Beth Sholom Innovative School, our goal is for children to love learning. Our curriculum is anchored in meaningful experiences, providing learning opportunities that promote collaboration, critical thinking, and inquiry. With a child-directed approach always at the forefront, teaching and learning are authentic, and we intentionally design our learning experiences to foster inquiry, communication, and creative expression. Through ongoing observation and assessment of the learning process, our educators mindfully plan curriculum. Learning standards and goals undergird these experiences and processes. We know that children learn through play. Playful learning is a pathway for intellectual, social, emotional and physical development. At TBSIS, we create thoughtfully prepared environments rich with possibilities to encourage children to explore playfully. Learners imagine things, take risks, test limits, discover what works and what doesn’t work, engage with other children, get lost in time and space, learn to handle failure, and conflict and experience incredible joy. Engaging in play and being playful in order to make meaning is an important part of a child’s development. Our Kehilla Approach (Hebrew for “community”) is our value system that defines how we live and learn within our Temple Beth Sholom learning community. For us, Kehilla stands for: kindness, empathy, honesty, integrity, lifelong learning, and acceptance. It frames our thinking, our acting, our planning, and our growing. Deep studies are projects that provide opportunities for learners to actively explore real-world challenges and problems. Deep studies are not just part of the day; they are woven throughout the daily curriculum. Project ideas are presented to the learners by the teacher about a social studies or science learning arc and are developed through learners’ interests, questions, discussions, and everyday encounters. Learners are immersed in deep studies for weeks at a time. These deep studies incorporate learners’ developing skills as readers and writers. All aspects of the curriculum (including the hard and soft skills, milestones, and habits) are organically incorporated. Children have wonderings and create theories. Educators support these theories with materials and various learning opportunities. Essential questions and big ideas at the beginning of a study are co-constructed by the educators and learners and are revisited throughout the study. Through the cycle of inquiry process, learners and educators frame or reframe issues or questions, investigate, develop plans, collect data, and analyze data all in a nonlinear approach. Our goal is for learners to develop a true joy for reading and writing. We address our learners as ‘readers’ and ‘writers’ to empower their involvement in the stories they read and write. To do so, they must be able to read and write independently and fluently. Using a balanced literacy model, we help learners develop appropriate skills and strategies needed to read and write. Within a workshop model, students develop their literacy dispositions and skills through whole class, small group, and one-on-one instruction. Regular word-study instruction helps children develop thinking about how to read, write, spell, and understand new words. Teachers College Reading and Writing Workshops and Fundations Word Study are used to support this learning. Learners feel that what they learn as readers and writers has meaningful and practical application in school and beyond and can serve as a vehicle for agency and change-making. Learners use math in real-world situations. They think logically about math, write about math, and understand numbers through games and manipulatives. Learners engage in meaningful mathematical problem-solving strategies and become critical thinkers. We use TERC Math Investigations to support this learning. Learning how to live and become a morally conscious member of a community is a central concept for our children. Our learners engage in meaningful studies around civics, history, economics, and geography where they use their problem solving, critical thinking, collaboration, inquiry, and perspective-taking skills. The children feel empowered that their voice makes a difference and begin to understand that others have similar or differing perspectives. Learning to respect these differences helps develop empathy, and children become equipped to constructively respond to and understand differences. They begin to make powerful connections between past and future and begin to develop a better understanding of the world around them. Children are naturally curious. Because we embrace this, our science experiences are inquiry-based. We explore four disciplinary science core ideas (science arcs): Earth and space science; life science; physical science; and engineering, technology, and applications of science. The learners are given the time and space to investigate, manipulate, analyze, discuss, record, and predict based on their observations and questions to create theories of understanding. Our language program nurtures learners’ communication skills and helps them become global citizens. Learning languages from an early age helps listening, memory, creativity, and critical thinking — all of which are processes that nurture the intellect and develop analytical dispositions. We currently offer Spanish and Hebrew in a wholistic approach, using both conventional and innovative ways to help children explore these languages and cultures. The goals of our Judaic Studies program are to support the learning of different aspects of contemporary Jewish life and to make Judaism pertinent to our learners’ lives. Our areas of concentration are: Mitzvot (acts of kindness), Torah and Holidays. Our program encourages learners to think about their place in the world and the importance of maintaining their connection to their Jewish community. Learners are encouraged to do Mitzvot and understand that acts of good kindness make their classroom space, school community, and the world at large a better place. Our program embraces teaching the concepts and ethics of the Torah through stories, songs, and creative expression. Involvement in different sports develops diverse lifelong skills in the physical, cognitive, emotional, and social domains. Learners are exposed every day to different sports such as Starfit™, gymnastics, dance and yoga (including mindfulness and meditation). In addition, our learners go to the Galbut Family Miami Beach JCC twice a week. Learners work with a coach playing soccer, basketball, flag football, tennis, and floor hockey. Learners have free play outside every day, weather permitting.